Description of "TRIZ- AN INNOVATION FIELDBOOK BASED ON TRIZ METHODOLOGY"
This is a special reprint edition of the popular book written by Dr. Salamatov, TRIZ Master and Chief Mentor of TRIZ Association of Asia. The book is a rich trove of examples of innovative problem solving and is a good reference for readers of all age groups. Dr. Salamatov demonstrates with the ease of an expert the application of core concepts of TRIZ (Russian acronym for Theory of Inventive Problem Solving) citing examples from engineering and non-engineering domains including art and history. The ability to think through a situation can be developed only through application of concepts. Dr. Salamatov has also provided a huge repository of problems with suggested solutions for some problems. As students of Dr. Salamatov, our only advice to you would be to actively participate in attempting to solve the problems by yourself before reading the suggested solutions. We invite you to begin your journey of discovery of this wonderful subject and wish you happy reading! Please feel free to contact us in case you are interested in furthering your knowledge in this area and evangelizing the concepts to likeminded individuals. Yuri Petrovich Salamatov: Phd and author of 50 inventions and many publications including two books on TRIZ to which the author has effectively contributed for over 20 years. He is the founder and Director of the Institute of Innovative Design and the Chief Mentor to TRIZ Association of Asia. 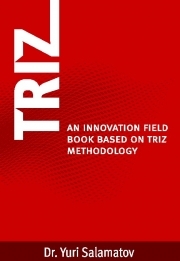 Reviews of "TRIZ- AN INNOVATION FIELDBOOK BASED ON TRIZ METHODOLOGY"